Will AI extend its reach to the realm of creation of art? Will it be possible in future that AI acquires its own self-consciousness and creates art in its own right? In March, 2016, AI beat the world champion of Go who once stated the game is art. The questions above, which were nothing more than fantasy, have appeared more and more realistic as technologies like deep learning have been developing drastically. That being said, what we call “AI art” is mostly nothing more than what the human being produces by using AI as an assisting tool. Now, we dare to state the opposite. From now on, the human being should be prepared for the situation that AI itself establishes its own aesthetics and creates art in the true sense of the word. Now we’re facing the world where AI poses fundamental questions to our basic values like intelligence, art, aesthetics, or human dignity. To reflecting such awareness as of 2017, this exhibition demonstrates the latest state of AI art by showcasing artists and researchers in Japan and abroad whose works engage with the theme. Centered on visual art, the exhibition also features a variety of genres including music, literature, conceptual art, and research presentation that deal with intelligence in general. Please join us in witnessing the world’s first ever exhibition specialized on the artificial intelligence. Nov 11 (Sat) 14:30-18:00 Collaboration with Artificial Intelligence - Day 1 concert B254 (outdoor), Center Bldg. Nov 12 (Sun) 11:30-13:00 Collaboration with Artificial Intelligence - Day 2 concert B254 (outdoor), Center Bldg. Jan 8 (Mon/Holiday) 19:30-21:30 Closing Party exhibition Café Grano, OIST Center Bldg. The exhibition categorizes aesthetics and art, respectively, into those by the human being and by the machine. This results in the four exhibition categories. A lot of art since Renaissance exemplify this category - art produced by the human being in accordance with human aesthetics. They are displayed as the introductory part of the exhibition. Systemic art, serial music, visual poetry in the 20 century can be seen as examples of art by the human being in accordance with machine aesthetics. In addition to those precedents, the exhibition also displays new works by artists in the 21 century who work on AI as the main theme (* living artists are offered to make new works that deal with AI). What we call “art by AI” today is art by the machine in accordance with human aesthetics, most of which are actually creation of the human being with assistance of auto-running AI programs. The exhibition deals with those works too, as an achievement of this field as of 2017. 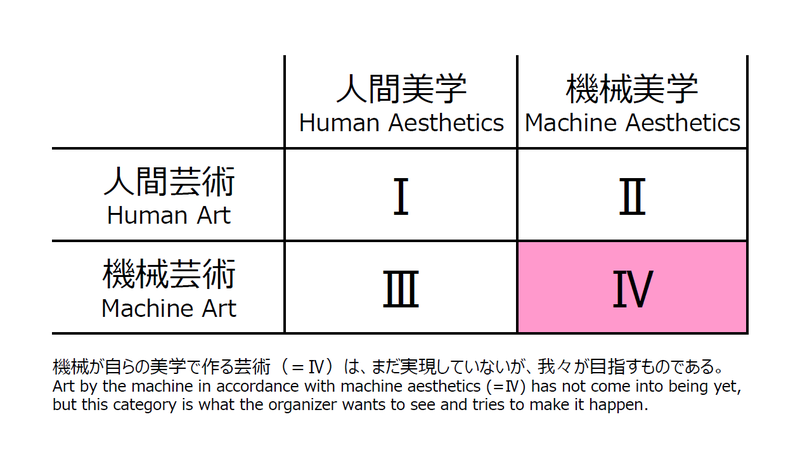 Art by the machine in accordance with machine aesthetics has not come into being yet, but this category is what the organizer wants to see and tries to make it happen. 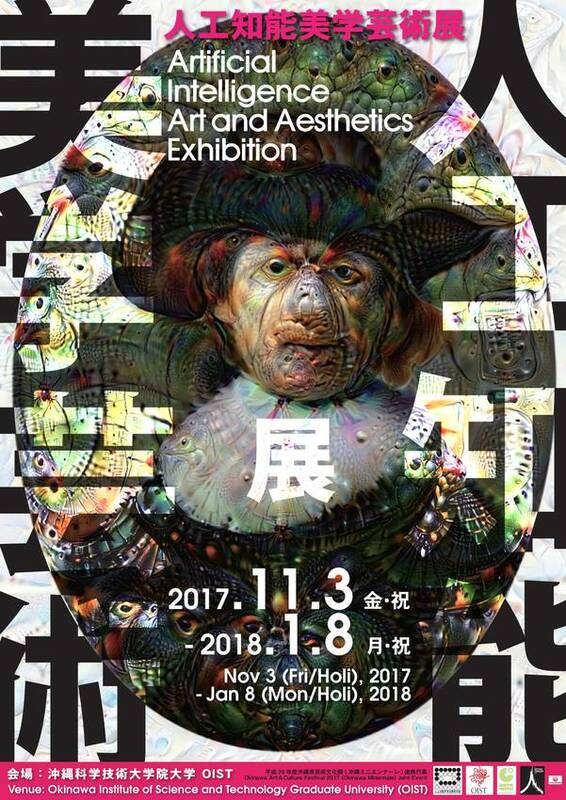 The exhibition introduces conceptual art works or research presentations in pursuit of this direction, as well as Manifesto of Artificial Intelligence Art and Aesthetics drafted by Hideki Nakazawa. Also, as routes to this goal, this section broadly showcases research findings, objects, artifacts, reviews of science fictions that all investigate the nature of intelligence.